It’s almost June, wow time has flown by since the new year! I’ve been 30 for almost three months now and have been so busy that I haven't had a chance to write up my wonderful birthday party with friends and family. My 29th year, the “power year” as my friend Megan calls it, was packed. I started blogging, started my masters program, became an aunt for the fourth time, started writing for Local in Season, witnessed some wonderful weddings, spent time with family and friends, and more! To kick off my 30th year, the hubby (who would like me to say he's still 29 for another week) was in charge of planning the birthday festivities. Not just picking the date and place, but the menu, drinks, food, the whole works. In a nod to our vacation we planned to Spain, he decided on a Spanish themed birthday fiesta to get us in the mood for the trip. The hubby called up our family culinary resource, my brother, for some menu consultation. My brother spent a summer abroad in Spain and has been cooking Spanish cuisine since he returned. He also put a call into our personal sommelier about some wine pairings. Well, little did I know that besides the surprise of the party details, my mom and brother came to town for the party! We started the party day with a trip to the Wayland winter market to interview Vic Tirrito, the Pasta Man. My brother picked up a few last minute ingredients and we headed back home. While we were at the market, the hubby and my mom picked up the Party Favors cupcakes we ordered for the party. The three of them spent the rest of the day preparing a Spanish Feast. Nobody left the party hungry! The menu for the evening, in photos. This serves four as a main dish, 8 as an appetizer. We had 2 of these for our party. 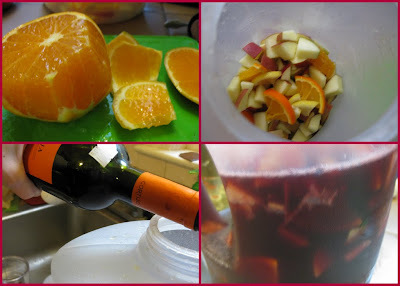 My contribution to cooking was a fruity sangria, adapted from a recipe from Chris over at the Half Hour Music Hour. I skipped the suggested brandy (none on hand), but followed the rest of the recipe. I made my own simple syrup (I can’t find the actual method I used) and it was delicious! Combine all ingredients in a large pitcher and refrigerate, covered, 2 hours or up to 2 days. Serve over ice. When the hubby asked what I wanted for dessert there was no question - cupcakes! 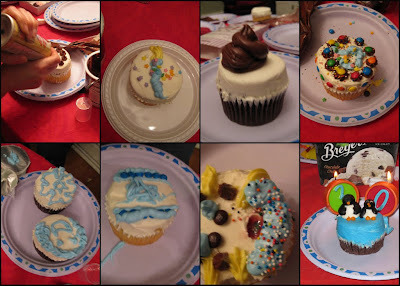 He picked out some adorable cupcake themed invites and we decided to have a cupcake decorating contest. I can remember a great birthday party I had when we I was little where we all got aprons and chef hats and decorated cakes. We love Party Favors cupcakes - but they won't sell them without any icing. So we ordered some with flat topped white icing and bought an arsenal of decorating supplies and icing. After enjoying the homemade sangria and a few bottles of wine, cupcake decorating fun ensued! They were all so great that we declared an all-around tie. Designs ranged from the Israeli flag to the Olympic torch, to uhh....I'm not sure what a few of them were supposed to be. Here's a look at the contenders. We had a wonderful time; it was so nice to celebrate with friends and family! This year I look forward to many fun adventures with new and old friends and a great time with family! It was a great time! I am also happy to vouch for the deliciousness of each and every one of these recipes! Happy Birthday!!! I'm excited you called 29 a power year... that's what I'm heading into in September. Ha ha. Your party looks fabulous, and all that food looks amazing. Love those penguin cupcakes! Oh, and I meant to tell you I love your new header too! Happy birthday! Those eats are my favorite kind! I turned 30 in March and am hoping this is my power year :) How did you get to write for Local in Season? El taller = Gracias! We really enjoyed the food - and we had a great trip to Spain following the party. Thanks for the note!